I finally made it to the new location of the Davie roost. The Tower Shops. I got there early, about 7:15 pm and thought instantly that I was going to have a problem. Unlike the old roost location at the Davie Road Racetrac gas station. This plaza was HUGE! A gigantic and busy strip mall with 4 big anchor stores, a Costco, Home Depot, several large restaurants, fast food joints and a Chevron gas station, all on one huge corner lot that had to be a mile wide. A quick glance around and i saw a few token martins but more Starlings and Grackles than anything. I was meeting Julie Levin from the Sun-Sentinal and not only did i want to see a show, I wanted her to see it too. There is nothing more fun than sharing your OCD obsession with someone who hasn’t heard you talk about it before. Lord knows my poor husband is OVER birds at this point. By the time August comes around he can’t wait for me to take all the bird houses down and get back to being “normal”. When 8 pm rolled around and all I saw was a few distant swirls of maybe 100 birds I thought I was going to be in for a huge let down but I was not to be disappointed…not tonight. By 8:25 I was surrounded by my birds. All over as far as the eye could see. The video camera does the scene no justice. For every 2 inches of sky you see with the camera, there is 180 degrees of more of the same. Thousands of birds twirl with distant dots of more birds behind them coming at you as if it were never going to stop. Almost as if God was pouring purple martins out of the sky and onto your lap. It was a true joy to watch and I could visit every night. Folke Peterson Wildlife Center CLOSING! A complete and utter tragedy has befallen Palm Beach County. In an era of Barry Madoff’s and Stockmarket dirtbags, the cost of some people greed has cost us the lives of countless innocent animals. With all of the economy issues, the plight of Folke Peterson has fallen by the wayside and they will be closing within a month. 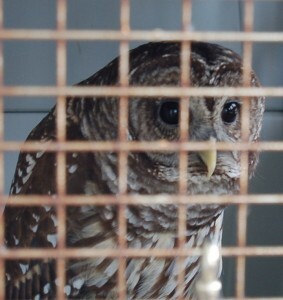 The animals that can not be relocated to other wildlife centers or released will be euthanized. The only other center that is close is a far smaller facility. Busch Wildlife Center will not be able to take the some 350 resident animals that call Folke Peterson home. It is a heartbreaking situation and I don’t understand how we could have let these animals down. Animals find themselves injured because of us. We run them over, we leave our cats out to injure them, we dump garbage in the waterways so that they can get stuck on it or swallow it. We, as a society are responsible for almost every animal that is bought into these centers. I saw the press that the center received when Heather Landstrom slaved to call out to concerned citizens. I saw the 5 second snippets on one of the local news stations. But then the news would spend 5 minutes talking about some trivial topic such as the rain or lack there of. From being somewhat behind the scenes I know that these people are still trying to find donors and other options to keep the center open. The facility is only 5 years old, state of the art and with so much potential. As a participant of the last 2 events to help raise funds for the center, I saw people working tirelessly for these sick and injured animals and it breaks my heart to see the center close. We Can Still Help Folke Peterson! Each day the center stays open gives them more time to find another option, to save another life. I donated…will you? The Davie Roost has MOVED! 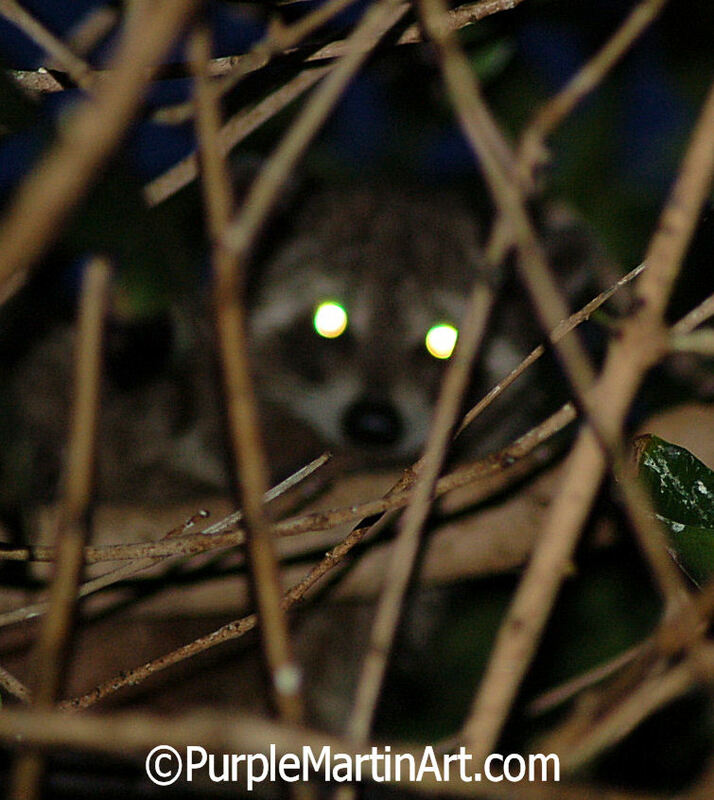 Apparently the raccoon predation was just too much for the purple martins at the Davie Road Racetrac gas station. They are no longer roosting at that site. I went on Friday night and the few purple martins that flew over head, never came down to the trees. The dead martins on the ground were still there, but no fresh kills. Apparently the roost was abandoned shortly after my visit on Saturday June 13. Fortunately for all us purple martin lovers, a fellow PMCA forumite “Stingray” was shopping in the area and happened upon the new roost location. It is now located at the “Tower Shops” just South of 595 on the East side of University Drive, in the same plaza as Home Depot. The chances of finding the new roost location is almost a miracle in my book and the disappointment I felt this Friday is now replaced with excitement again. woo hoo! I can’t wait to go and see the new spot. I hope the folks at the Tower Shops greet the purple martins with the same welcome attitude that they enjoyed at Racetrac Gas station. The potential for a negative response is high considering there is no overhead cover to protect any shoppers from the rain of bird poop that they will be experiencing. I have been ridiculously busy trying to prepare an article for you on emergency care of purple martins…I should say, first responder care of purple martins. I went to Folke Peterson Wildlife Center on Friday and met another one of their wonderful Veterinary Technicians, Faith, who let me photograph the HY purple martin while he was force fed. He is still not accepting food from the hemostats and his outlook is poor. Other than the fact that he is being force fed three times a day and can not fly, he appears calm and comfortable. A perfect gentleman. 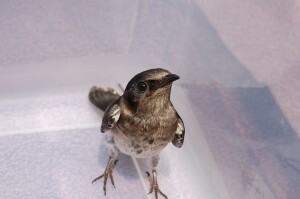 Other interesting finds at the Wildlife Center was a Chimney Swift nestling that was brought in recently. Eyes shut and chattering loudly, the little nestling looked so out of place in his box. My heart bleeds for this little guy. For great information on Chimney Swifts and what you can do to help these birds visit ChimneySwift.org I was shocked to find out that contrary to what I had read on the swifts breeding range, South Florida, the West Palm area to be exact, has a nice little colony of swifts that live out my way. I am eager to convince my husband of the need to put up a Chimney Swift tower! I am so excited for this project for next year. Can you imagine THAT on a webcam? 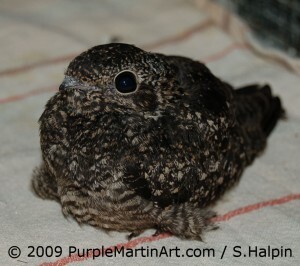 Another interesting patient at Folke Peterson was a juvenile NightHawk. Which is quite the coincidence considering that I recently wrote a blog entry about these illusive birds that I NEVER thought I would see so close. Like a pet rock, it sat in its cage with its big eyes staring back at me. A curious bird and not very bird looking at all, up close. Faith told me of the odds against rehabilitating this bird and all birds that are strict aerial insectivores. A diet that is never fully able to be replicated, humans can only come up with a fair approximation of the dietary needs of such birds. I hope this one makes it too. Good news on the HY purple martin! 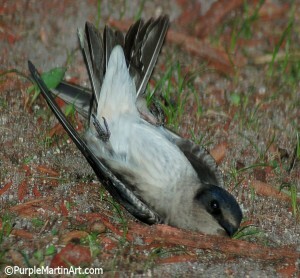 In yesterdays post I wrote about the injured martin I found laying upsidedown at the base of a tree at the purple martin roost. Last night I fed him some scrambled eggs and this morning I fed him some more eggs and about a dozen large flies I caught. Yes, can you imagine me catching flies to feed a bird? What purple martin landlords will do for these birds. The martin seemed in good condition but just didn’t want to fly so I had decided to bring him to Folke Peterson Wildlife Center. Later in the day I called and Vered, the Certified Veterinary Technician at FPWC, told me that she also suspected head collision trauma. The bird had received some medication to decrease any swelling in the brain and if all goes well he may make it to Brazil yet! Hopefully he won’t get to close to that raccoon at the roost before he flies south. The question is now begging to be asked, What is head collision trauma and what should you know about it? We called this type of injury “deceleration trauma” in my nursing days. This little purple martin probably flew into the tree at the roost or perhaps even another bird in flight, nothing could have prevented this accident. Fatal head trauma happens all the time, and most of it is completely preventable. Did you know that window collisions are the number 1 human related cause of death in birds. We are talking about estimates of 100 to 900 MILLION dead birds per year from flying into glass windows. www.Flap.org has a great list of the top 13 human related causes of bird deaths and the info on this site is sobering. Check it out HERE. But what should one do when you find a victim of a window collision? 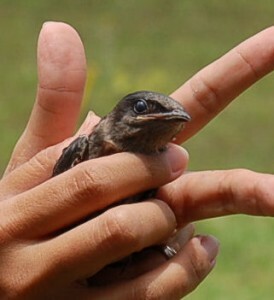 Read this article by FLAP called Enhancing Recovery: Helping Bird Rescuers Help Birds . Though there was no way to prevent this young martins collision, most of the human related collisions can be prevented. How can you protect birds from window collisions? Window Screens break up the reflection of the glass. Hanging any number of objects in front of window like old CD’s, ribbon, suncatchers, stickers or decals such as WindowAlert are a great help also. I will keep you up to date on the little guy. Davie Florida Roost- MARTIN DOWN!!! Today has to be one of the highlights in my short yet thrilling experiences as a Purple Martin Landlord. Tonight at 7pm my husband and 2 young boys took me to the RaceTrac gas station on Davie Road in Davie, Fl. It was the most spectacular thing I have ever seen. And to think that this roost is SMALL!!! Photos can not do it justice. I tried taking photos and I felt like I was trying to photograph the Grand Canyon with a Polaroid. I can only wonder the splendor of a large roost like those in Texas, Louisiana or Pennsylvania. My husband took a guess and says somewhere around 5,000 birds or so. In a photo I took I counted 200 martins in that small area alone. And the sky was covered with them. I highly encourage any local birders to check out this most amazing show. On a sad note, as I walked about before the martins came in force I noticed the ground under the trees that the martins are roosting in, was littered with dead martins in various stages of consumption. Piles of feathers, martins with heads chewed off, wings and other bits and pieces covered the grass. I was aghast and at first I assumed that Owls were arriving at night to feast on the martins. That may well be the case but then my husband pointed out the real culprit. A large raccoon scampered across the parking lot and climbed the first tree. It became quite apparent that the raccoons are having a nightly banquet of bird. Of course they don’t have the decency to finish one birds before killing another. I walked from bird corpse to bird corpse wondering what I could do…trust me, I had some crazy thoughts. As I walked about taking photos I noticed one of the “corpses” was looking back at me. Laying on its back with his head turned so he could see me, a fledgling Purple Martin lay moving his short feet in a bicycle riding fashion. I approached slowly and thought it would right itself in time to fly off, but it did not. I picked him up and gave him a look over. A perfectly alert little HY purple martin. His eyes are sharp and his temper was quick but when I tested his wings he did not seem to even want to flap them. Weak or injured he is now resting comfortably in a dark box with a crop full of mealworms and scrambled eggs. I will take him to Folke Peterson Wildlife Center in the AM to be checked out. If all looks good I hope to return him to the roost to join the other martins. It is late and my heart is happy so off to sleep. I will post more pictures of the roost in an upcoming blog entry. So check back soon! The first wave of fledglings has apparently moved on. 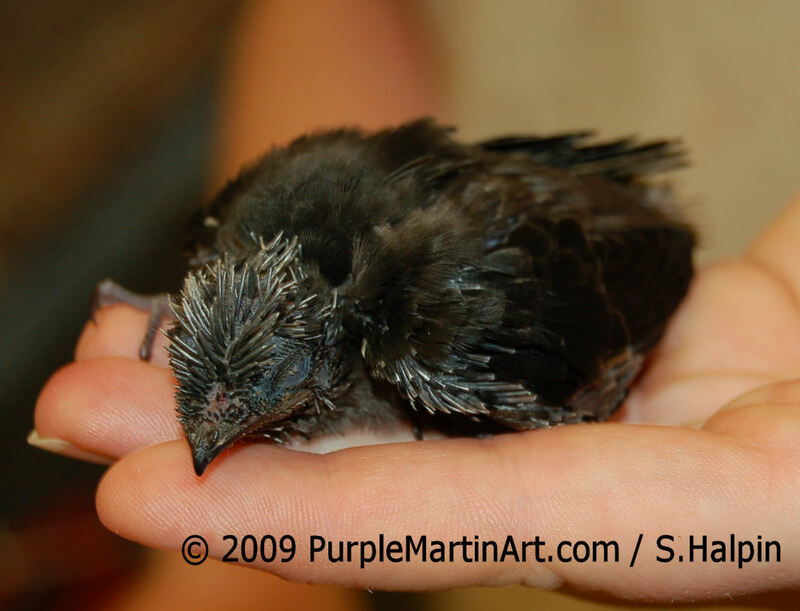 After some 60 purple martins successfully fledged they had been returning (for the most part) every night to sleep. Today I noticed a much smaller group before sunset on the gourd racks and they took off as a unit to parts unknown. They did not return tonight. I have been noticing that the martins have been acting more and more flighty. Probably due to the high number of inexperienced youngsters that seem to be more nervous than their older more seasoned counterparts. As soon as I walk outside they fly off in a large group only to settle for a moment before flying off again. They actually seem to enjoy their new found freedom in the air and my heart lifts up with them every time they take off. After Purple Martins fledge, the parents begin taking them to “assembly areas” where they roost at night. The birds eventually move to the premigratory roosts or staging areas which serve as a final stop over before the birds begin their migration to South America. I must admit though, my sadness that this move away from “home”, makes me sad. The season is another step closer to being over in the south. Soon it will be time to visit the only premigratory roost I know of in Davie. Though a few more babies have been added to the count almost all the other nests are way to close to fledging to check. After those birds fledge my season will be basically over. For those of you with new sites, or those that do not have a colony yet. NOW is the time to play dawnsong and keep your housing up. The youngsters are making the rounds and are visiting housing. If your housing is situated correctly and is attractive to the martins they will return. Remember that though my birds will return to my yard, the purple martins that fledged from my colony will mostly disburse to other locations. A partial nest check is over due and I will try for either June 6 or this weekend to check the numbered rack and the aluminum house. As I mentioned there are too many nests approaching fledging age to check the lettered rack. After the problem with wet nests I am understandably nervous of what is in store. but I know in my heart that I have done my part and next year I will again strive to do more. 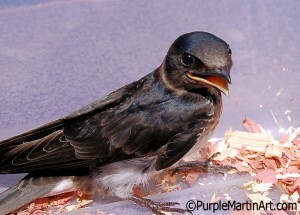 Remember, I will be doing a Purple Martin Presentation at Folke Peterson Nature Center on Wednesday June 17 at 7 pm. I hope to see you there!